Identify relevant use cases for your company data. Evaluate the business potential of the use cases. Explore your data landscape and discover new data sources. You are your required increases. Exclusivity, availability and usage rights. Define the necessary processes for refining the data. Specify the necessary tools, people and partners. Identify potential errors early and define the critical assumptions. Visualize and communicate your data strategy to your team, decision makers and investors. 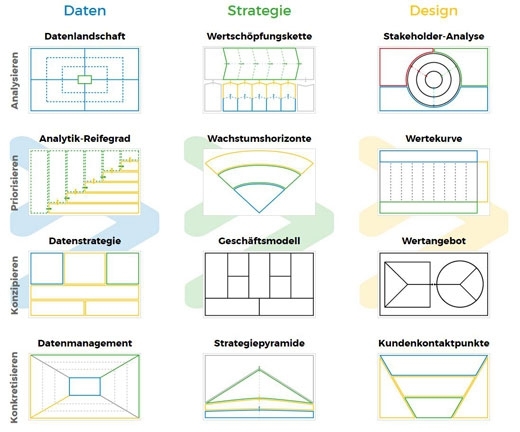 What is Data Strategy Design? Data strategy: to identify, concretize and evaluate data-driven use cases. Data landscape: to explore your own data landscape, to discover existing data assets and to open up new data sources. Analytical maturity level: to determine the analytical maturity level of your own company or customers and to select the appropriate use cases and tools for increasing the degree of maturity. How to use Data Strategy Design? Start with the Business Model Canvas, the Value Proposition Canvas, or the Customer Contact Points Canvas to better understand your business model, your value proposition, and your customer journey, and to identify potential use cases for data-driven practices. Concretize the use cases with the Canvas data strategy and use the Canvas data landscape to find out what data is available to you. The analytics maturity level canvas helps you to compare multiple use cases and to define a roadmap for their implementation. Work in a team and bring together business management, specialist departments, IT and data analysts. Use the Stattys Notes for your ideas, using different colors, such as green for existing data sources, tools, etc., red for nonexistent, and yellow for those resources you're not sure about. All canvas have guide questions printed to help fill the canvas. More information can be found on Datentreiber.